Disney's stock might not be commonly thought of as a "dividend stock" -- but here's why some dividend investors might not want to pass it by. Walt Disney (NYSE:DIS) stock's total return has significantly beat the broader market over the long term. However, the stock isn't one that most investors think of as a "dividend stock" because its dividend yield – currently 1.4% -- is quite modest. Dividend investors who need strong current income now should probably pass on Disney, as better yields can be had elsewhere. However, investors with an eye toward bringing home potentially juicy yields in the future should consider investing in The House of Mouse. The company has solid growth potential and plenty of room to continue generously hiking its dividend. Keep in mind one's true yield isn't based upon the current price of a stock, but upon the price at which that stock was bought. 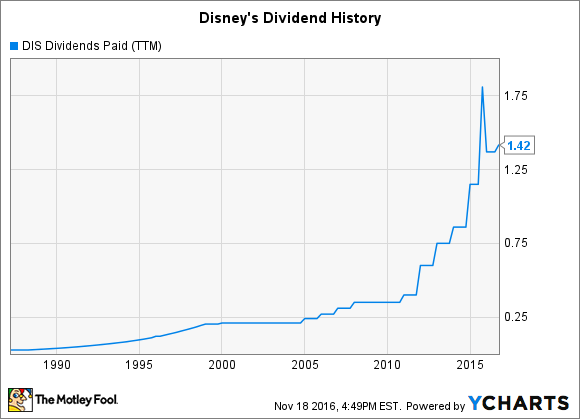 Let's examine Disney's dividend growth potential. Data sources: Yahoo! Finance and YCharts. Last increase refers to ex-dividend date. Data as of Nov. 17. Disney has a long history of paying cash dividends, but has upped its dividend game in more recent years thanks to its strong earnings and free cash flow growth. The company historically paid its dividend on an annual basis, but began paying its shareholders semi-annually beginning in 2015. This shareholder-friendly move surely made the stock more attractive to some dividend investors. DIS Dividends Paid (TTM) data by YCharts. After a 4-year dividend-hike drought in the early 2000s, Disney started increasing its dividend again in 2004. And except for two years during the Great Recession -- 2008 and 2009 -- has raised its dividend every year since then. We can probably attribute some of this increased commitment to rewarding shareholders through dividend raises to CEO Bob Iger, who assumed the top spot in 2005. And we can certainly attribute much of the company's financial and stock-price outperformance over the last decade to Iger, though he's also had a strong top management team. Disney has made three huge movie-studio acquisitions -- Marvel, Pixar, and Star Wars-creator Lucasfilm -- during Iger's tenure that have helped drive its earnings and cash flow, allowing the company to more generously reward shareholders via cash dividends. It's best, however, to examine a company's cash dividend payout ratio to get a much more accurate picture of how much a company's dividend policy is costing it. This metric is the proportion of free cash flow (after preferred dividends) that is paid as dividends to common shareholders. Cash is the real McCoy when it comes to gauging how well a company's business is performing, while net income is only an accounting measure. Disney looks great using this measure, too: Its cash dividend payout ratio of 27.4% strongly suggests that investors can keep on banking on annual rate hikes. DIS Cash Dividend Payout Ratio (TTM) data by YCharts. 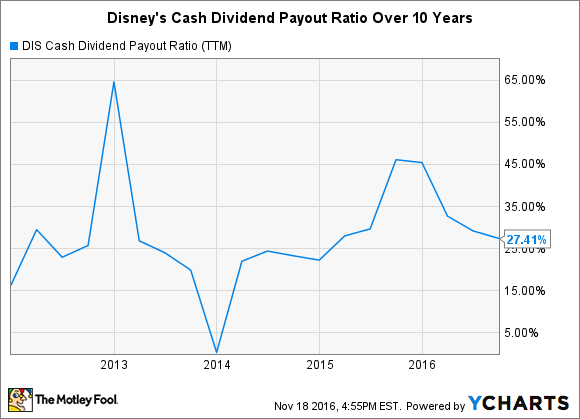 While Disney could double its dividend right now -- payout ratios and cash dividend payout ratios in the 50% to 60% range are generally considered quite conservative -- investors should not expect the company to make such a move now or in the near future. This is a good thing for all but those whose primary goal is maximizing current income. Maintaining a strong balance sheet -- it had $4.1 billion in cash at the end of the last quarter and a reasonable debt-to-equity ratio of 42.6% -- will provide Disney with a greater capacity to grow its empire organically and pounce on attractive potential acquisitions that come its way.